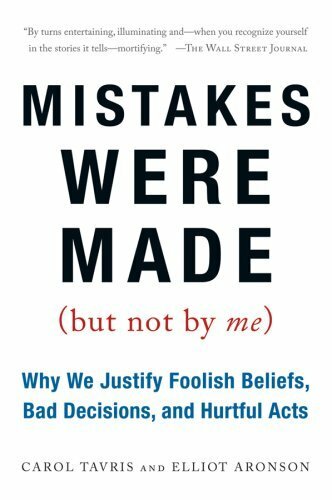 The best piece of non-fiction I’ve read this summer – by a long shot – is the little social science paperback Mistakes Were Made (But Not by Me): Why We Justify Foolish Beliefs, Bad Decisions, and Hurtful Acts. The title gives away the appeal. The authors, Carol Tavris and Elliot Aronson, place “justification” at the very center of day-to-day life, arguing that you simply cannot understand yourself or other people without understanding the (universal) justifying impulse. They go so far as to attribute most of life’s problems and a great deal of human suffering to its prevalence and power, all the while grounding their observations in Leon Festinger’s notion of “cognitive dissonance” (more on that next time). At times Mistakes Were Made (But Not By Me) even reads, well, like this site (on a good day!). Or, I should say, on a good day our site reads like it. Once you take a gander, you won’t be surprised to hear that it was recommended to me by a reader who felt the diagnostic congruencies were uncanny. We look at the behavior of politicians with amusement or alarm or horror, but, psychologically, what they do is no different in kind, though certainly in consequence, from what most of us have done at one time or another in our private lives. We stay in an unhappy relationship or merely one that is going nowhere because, after all, we invested so much time in making it work. We stay in a deadening job way too long because we look for all the reasons to justify staying and are unable to clearly assess the benefits of leaving. We buy a lemon of a car because it looks gorgeous, spend thousands of dollars to keep the damn thing running, and then we spend even more to justify that investment. We self-righteously create a rift with a friend or relative over some real of imagined slight, yet see ourselves as the pursuers of peace – if only the other side would apologize and make amends. 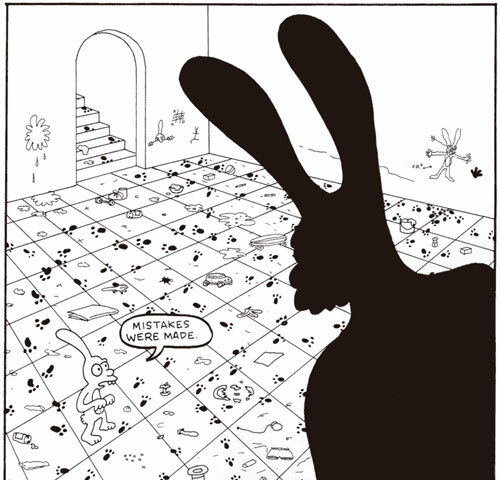 But, you say, [what if] the justifications are true! Hotel room charges do include the costs of repairs caused by clumsy guests! The government does waste money! My company probably wouldn’t mind if I spend a little time on email and I do get my best work done (eventually)! Whether those claims are true or false is irrelevant. When we cross these lines, we are justifying behavior that we know is wrong precisely so that we can continue to see ourselves as honest people and not criminals or thieves. Whether the behavior in question is a small thing like spilling ink on a hotel bedspread, or a big think like embezzlement, the mechanism of self-justification is the same. By understanding the inner workings of self-justification, we can… make sense of dozens of [the] things that people do that would otherwise seem unfathomable or crazy. We can answer the question so many people ask when they look at ruthless dictators, greedy corporate CEOs, religious zealots who murder in the name of God, priests who molest children, or people who cheat their siblings out of a family inheritance: How in the world can they live with themselves? The answer is: exactly the way the rest of us do. To read part two, go here. Being caught is a good thing.Repenting is a necessary thing.Forgiving is a holy thing. Why isn’t there an AA for chronic justifiers? Or is that what the church is supposed to be? Anyway, I am a poster boy for this. Agreed, this is a terrific book. This is all why grace has to be central to everything we do, it must be the air we breathe. The only path to honesty is to constantly know we are accepted and forgiven. One of the things that is a corollary to this behavior, as C.S. Lewis points out in Mere Christianity, is that we have a need to constantly appeal to justice. We can’t just cheat or steal or lust; we must find a way to justify it, to find a way to explain why we were compelled to do so or to show why we didn’t really do what it looks like we did. We spend so much energy proving our innocence. We go to extremes to avoid the scandal of forgiveness – for ourselves and others. It stems from the crazy idea that grace is only operative when we don’t need it; the obvious truth is, forgiveness must enter when forgiveness is required. One of the things I really love about this site is that you point out that we see the underlying truth of these things in pop culture, and in everyday life. It isn’t a religious thing, it isn’t a point of doctrine. It is the warp and woof of human existence. Thanks! That’s about the nicest thing you could have said! Thank you for the encouragement. I’m buying this today. So incredible.